posted on the billboard of a single life. The late Ghanian poet Kofi Awoonor, who died at the hands of terrorists in Kenya in September 2013, is perhaps one of Africa's most celebrated poets. 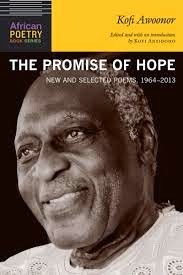 This collection of a half-century of verse, The Promise of Hope: New and Selected Poems 1964-2013, was planned before his murder and yet there is a sense of death lurking in his most-recent poems. But it would be a mistake to construe this as being a wholly negative affair, as Awoonor's poems here address a wide spectrum of human emotions and reactions to that nebulous thing called hope. pluck that lingering hair with a wince. and share the night with me on this sea. Let me sing the song you gave me. Let me dance to the drums you gave me. While the death element is still present (the poem references an 1980s American military shooting down of an Iranian civilian plane), there is more of a pleading tone, of not letting a dream not, of permitting a song given to be sung. It is more plaintive than the latter poems, but even within this somewhat-begging note, there is a sense of hope burning under the surface, a sense that the other poems in the 1992 collection provide, mostly through the guise of outrage over socio-political injustices, many of them perpetrated by the United States. are the same mother's children. Here the post-colonialist voice is strongest, here comparison of the US to Byzantium, with its decadent, hollow nod to multi-lingual gatherings, is constructed. Awoonor mixes in ancient Roman, medieval Italian, and modern 20th century events to create an arresting image of a middle-aged man seeing that in order for a dream to be achieved, a lot of work and suffering lay ahead. This is perhaps one of the more biting poems in the collection, but it does represent a way station along Awoonor's journey, via verse, from a frustrated man to an elder who has come to accept his mortality even before it was violently taken from him at a Nairobi shopping mall. It is fitting to stop here and let the reader ponder just how this "promise of hope" has driven the poet over his last fifty years of life. For myself, it was a very moving and excellently-constructed collection, full of memorable stanzas and poems.